At the Pentagon yesterday morning, the men and women in charge of the nation's defense were staring at news reports of the attack on the World Trade Center. "You know, the next best target would be us," mused Tom Seibert, a network engineering contractor, watching TV. Five minutes later, Seibert and his associates heard something that sounded like a missile, then a loud boom. 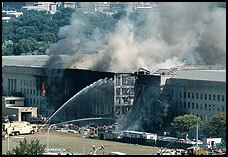 The massive Pentagon building trembled. Flames shot through some corridors and chunks of the ceilings started raining down. "We just hit the dirt," said Seibert, 33, of Woodbridge. "We dived instinctively." A hijacked American Airlines Boeing 757 had plowed into the western side of the Pentagon, blasting a giant hole into the concrete symbol of U.S. military might. The attack caused scores of casualties and turned the Pentagon into a scene of panic. "Everybody started saying, 'Evacuate, evacuate!'" said Air Force Col. David Kopanski. "It's pretty devastating," he added. "We've all thought this could possibly happen one day. Somebody has touched our country." Rescue crews pulled six bodies from the rubble last evening and they prepared to head into the building to recover what they were told could be dozens more bodies. It wasn't clear whether those were passengers on Flight 77 or Pentagon workers. The Pentagon is one of the world's largest office buildings, with about 24,000 employees, a landmark since it was built during World War II. Built of 435,000 cubic yards of concrete, it had seemed invincible. The jet ripped a giant hole in the west side of the building near Washington Boulevard that stretched from the ground to the roof five floors up. At least four floors pancaked upon each other. Workers and neighbors stood staring in shock at the charred, smoke-wreathed building; one described it as looking like a doughnut with a large bite taken out. Flames crackled through the building for hours. Eyewitnesses in nearby cars and apartments realized something was wrong when they saw a passenger jet traveling fast below treetop level over Interstate 395 just after 9:30 a.m.
Terrance Kean, 35, who lives in a 14-story building near the Pentagon, heard the loud jet engines and glanced out his window. "I saw this very, very large passenger jet," said the architect, who had been packing for a move. "It just plowed right into the side of the Pentagon. The nose penetrated into the portico. And then it sort of disappeared, and there was fire and smoke everywhere. . . . It was very sort of surreal." Inside the Pentagon, the crash set off different reactions. In some offices, military personnel calmly shut down their systems, locked down their computers and walked out of the building. In more damaged areas, panic reigned. A 37-year-old Marine major said he was at a meeting in the innermost A Ring when he heard a thud and felt the building shudder. He and his colleagues rushed to help rescue people from an area that appeared most heavily damaged, the B Ring between the corridors 4 and 5. "From two-star Army generals to Marine officers, to Navy medics and petty officers, to Army officers and civilian contractors, everybody helped," said the sweaty, exhausted major, who was wearing a bloodstained T-shirt and carrying a face mask as he took a break from rescue efforts. The major, who declined to give his name, said he was part of a group that extricated a civilian pinned down by fallen pipes, chunks of wall and other debris. To keep from being overwhelmed by the hot, thick, black smoke, the rescuers passed wet T-shirts to one another as they removed the debris in an assembly-line fashion. "It took 30 men 30 minutes to get just that one guy to the door 15 feet away," the major said, adding that the man appeared to have suffered cuts and bruises. He said that hundreds of people worked in the B Ring area and that it was "decimated." "That heat and fire, it could eat you alive in three seconds," he said. The area of the building hit by the 757 has the offices of Army and Navy operations personnel. The area hit by the plane had recently been renovated, and officials said they hoped the death count would be limited by the fact many people had not yet moved into their offices. The search for survivors was hampered by the intense heat and smoke. As late as 6 p.m., rescue teams were having trouble getting close enough to the worst damage to start their work. "We went down that first ring, but we only got 100 feet," said Derek Spector, 37, an Arlington firefighter who was with one of the first crews to approach the fire. "It was an intense amount of heat." Outside the building, Pentagon employees who had just fled collapsed on the lawn, some crying, some struggling to get a connection on cell phones, others looking dazed. Tamara Moore, an employee in information management support, spoke haltingly. "We knew the building had been hit. We could feel it." She paused. "It's tough. It's tough to talk about. I ran. I don't have anything. I don't have my pocketbook. I'm worried. Some of my co-workers were in that area." Ambulances and government helicopters raced to the scene after the attack. More than 300 military and medical personnel rushed into the building in waves, many bearing stretchers and medical equipment. As firefighters trained streams of water on the blazing building, rescue workers rushed dozens of people on stretchers from the interior onto the grass. There, emergency medical technicians from across the region laid out mats, set up intravenous tubes and organized paramedics and Pentagon employees into teams of litter-bearers. "We've got people in there dying," someone shouted. At one point, panic set in when a rumor swept the crowd that another attack was imminent. "There's another plane coming," someone shouted. Authorities ordered everyone to get under a concrete underpass. The crowd waited uneasily, staring at the sky. But there was no other attack. A Navy civilian said that when she reached the grassy area, "I started seeing people hurt very badly. There was blood, maybe burns, people looked like they were pelted with concrete." She volunteered to drive an injured woman and a doctor to an Arlington hospital in a private car, but they became stuck in traffic. The civilian, who declined to give her name, said she then pulled over and began banging on the windows of nearby cars, hollering at them to get out of the way. "The doctor was saying, 'Floor it,' " the civilian recalled. "For 15 to 20 minutes, I was screaming at the top of my lungs for people to get out of the way." Navy Lt. Evelyn Gibbs, who works at the Pentagon Annex nearby, had just dropped her children at the Pentagon day-care center when she heard about the attack. "I grabbed my things, and I started running for the Pentagon. . . . I was heading for the day care. I ran, I ran fast. It was about three miles. I just kept running. Good people helped me. They showed me shortcuts. I saw people being carried out of the building. They were bleeding, they were on stretchers," she recounted breathlessly. Finally, Gibbs got to the day-care center, only to find the children gone. She found them in a nearby grassy area with their teachers. "The children were oblivious. They were outside. They were playing. They were fine," she said. By afternoon, the investigation into the attack was underway. At one point, a column of 50 FBI officers walked shoulder-to-shoulder across the south grounds of the Pentagon, picking up debris and stuffing it into brown bags. The lawn was scattered with chunks of the airplane, some up to four feet across. In the evening, some 100 people gathered on a hill in Arlington with a panoramic view of the Pentagon and the city beyond to see the damage for themselves. Several set up cameras on tripods or pointed digital camcorders at the building as smoke continued to pour out about 5 p.m.
"I was just looking for someplace that I really could get in touch with what happened today," said Keith Whited, 49, a real estate agent who lives in Mount Vernon. "I can't imagine how anybody could even conceive or do anything so terrible. "I think a lot of people up here are just curious. I think a lot more up here are like me. They're just trying to understand how this could happen."